Magician David Fox is a fantastic choice of entertainment for your wedding day celebrations in Telford. Events organisers in Telford often contact David Fox when they are planning parties and social functions. 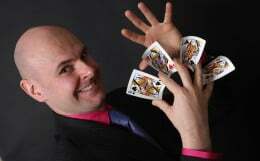 For all types of corporate event in Telford, David Fox is an outstanding choice of magician . Give your next event in Telford a magical touch with David Fox. Telford man of magic and mystery David Fox is perfect for your next social event around this vibrant part of Shropshire. David fox is the first choice of entertainer for weddings, parties and corporate functions in Telford and Wrekin. David was delighted to poll the most votes internationally in this year's wedding industry experts' award and won the much deserved prize of 'Most Popular Wedding Magician'. David Fox's recent wedding performance at Laura and Ben's wedding celebrations at Albrighton Hall went down a storm. He was also delighted to amaze and astound Mr and Mrs Wilkes' guests at The Old Vicarage, Worfield. 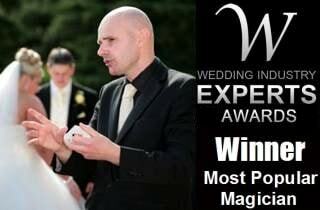 David is the finest wedding magician in the land and is much sought after by couples planning their special day. A popular magician for house parties and more intimate events around Telford, David provided a magic show, close-up magic and even balloon modelling at Sarah's 30th birthday party in the Madeley area of the town. His magical extravaganza was such a hit that it received a glowing review in the local 'Scene Telford' magazine. David is also a popular magician for university and college events. Locations such as Telford University Campus are ideal for his close-up magic and exceptional ability to entertain and engage audiences. Indeed, he was also very proud to provide entertainment at the Royal British Legion's charity event in Telford Town Park. This wonderful performance led to David being invited to entertain celebrities at HRH Queen Elizabeth II's Diamond Jubilee celebrations in London. Companies David has provided customised magic for around Telford and Wrekin include: KRL, Telford Freight Terminal, and Preston Innovations of Shropshire.